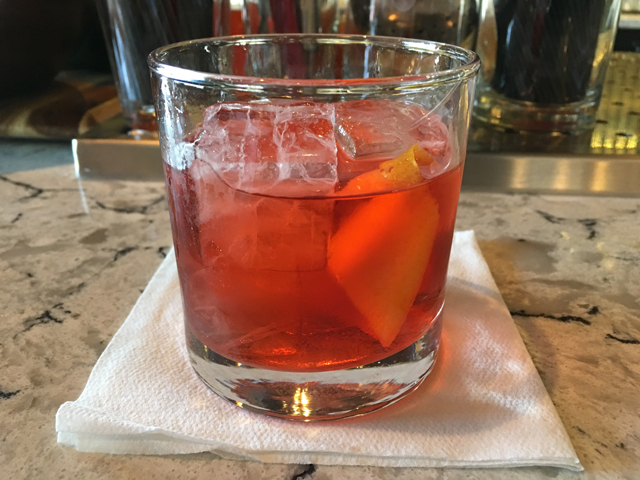 For as long as I’ve had this blog around, I’ve not covered the Negroni here in any aspect. Today changes that with a visit to a local bar to celebrate Negroni Week, which happens each year during the second week of June. The classic Negroni recipe is pretty simple: gin, sweet vermouth, Campari and an orange peel twist. This particular classic Negroni I had today was made with Martin Miller Gin, which I hadn’t consumed before. It’s a basic London Dry gin with the same properties of most gins, but this adds a cucumber and lemon and lime infused flavors, which don’t take away from the Negroni taste and consistency. Then adding the Campari brings it all out with each sip. But beware, add too much Campari and you can over-sweeten the Negroni. My rule is more gin, less Campari. After several spins with a cocktail spoon, it’s topped off with an orange peel, twisting it and rubbing it around the rim of the glass before inserting it on the side of the glass. I normally only have one Negroni in a night, but I made an exception this time. Under Current is the local bar my daughter and I visited, which is located a few blocks from the center of downtown. 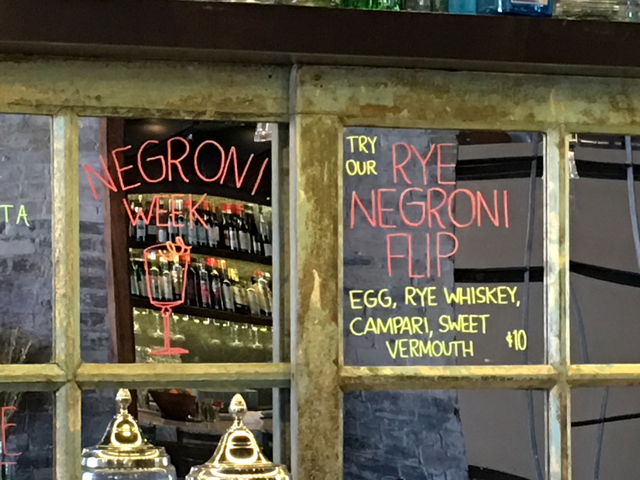 They had a special variation on the Negroni called Rye Negroni Flip. 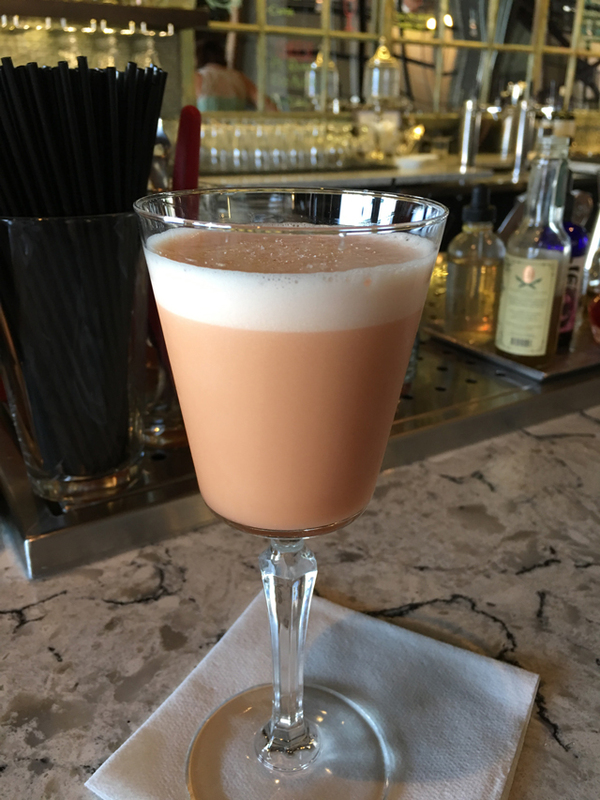 Made in a cocktail shaker, it uses rye whiskey (George Dickel brand) instead of gin, adding a raw egg to the standard Campari and sweet vermouth ingredients. The finished drink is a bit on the frothy side with a more creamy orange color. The drink was delicious and it had a nice smooth aftertaste to it. I will review the scene and various drinks at Under Current in a future blog post. It’s part of the Current seafood restaurant and drinks are on the fancier side. It was a great choice for celebrating Negroni Week. Gin has been one of my top favorites in the spirit categories.